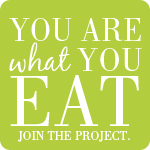 Today marks the first day of the Food Matters Project that the lovely Sarah and Kate have started. I've joined along with other food bloggers, and we'll be cooking through Mark Bittman's Food Matters Cookbook. Read here for more information about the book. 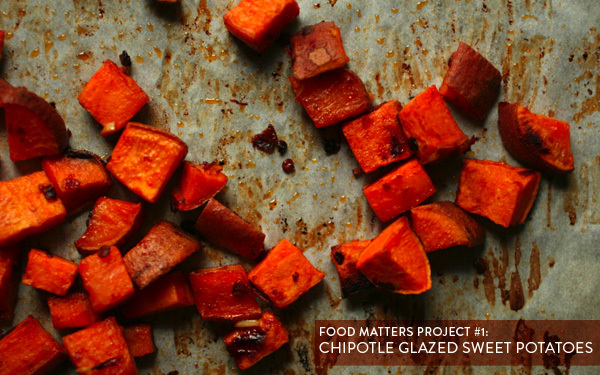 Sarah made the first recipe for chipotle-glazed squash skewers. Don't they look tasty? I didn't have any squash, so I substituted sweet potatoes instead. I made the chipotle sauce and wow, is it addictive. I rubbed it on diced sweet potatoes and roasted them for 30 minutes at 350 degrees. 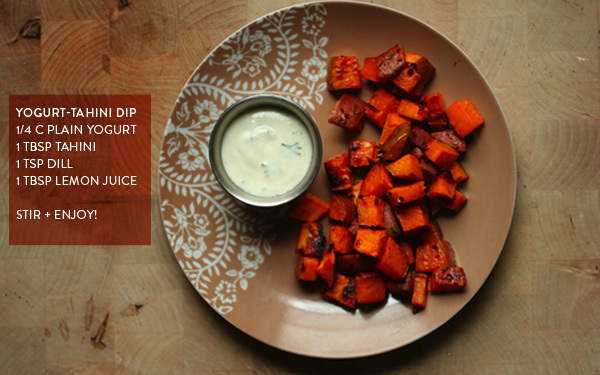 Then I made a yogurt-tahini dip to go along with the spicy potatoes for an afternoon snack. Make sure to follow along to see other interpretations of a new recipe each week! Mm, spicy sweet potatoes! I totally called the chipotle sauce addictive as well. It really is! Can't get enough of it! I'm going to buy some tahini tomorrow and can't wait to try your dip. This is a beautiful recipe. Love the colors. I have enjoyed seeing everyone's version of this. I cannot wait to try this. By the way, I love that you are in Raleigh! I live in Fayetteville and have not heard of other food bloggers in the area (although I am sure there are plenty). Look forward to reading more. This is my first time to visit this post and simply impressed a lot by your valuable sharing. Thanks mate. somehow i missed this post! i love the dill! yum! I love spicy potatoes and spicy meatballs.